Mavis Walker has a stalker, but that’s not her only worry. She has a past that’s dogging her as well. The more she struggles to cope, the harder her troubles hound her. 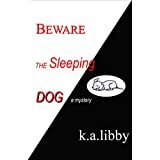 Beware the Sleeping Dog will be offered as a password-controlled PDF file on this site and for purchase as a download into e-readers through Barnes & Noble and Amazon. Follow this blog for specifics. I love your blog! You have a lot to be proud of for this great achievement. Congratulations on your first novel. Can’t wait till it’s available on Amazon! Thank you for your support, Deborah. The kudos on my blog go to Becky Milot-Bradford. My book and I have become best friends through the writing process and it is a bit intimidating to put it out there for scrutiny! But what’s the point of writing a book if I don’t publish it?